Developers have started work to transform the site of a historic former North Yorkshire railway station into a £20m-plus collection of family homes. Wetherby-based Berkeley DeVeer is breathing new life into the three-acre brownfield site at West Tanfield, six miles north of Ripon. Having played a key role in World War Two D-Day preparations. It has stood idle since being used most recently for light industrial purposes. The 42 hand-crafted, eco-friendly properties – which will include 8 affordable homes – sit on land off Mowbray Terrace. Surrounded by countryside, the development – known as Regency Place – was once home to Tanfield station, which opened in 1875, before closing to passengers in 1931, and shutting down completely in 1963. The first phase of the development has now been launched to market. Prices range from £275,000 for a three-bedroom semi-detached house, to £450,000 for a detached five-bedroom property and £460,000 for a superior four-bedroom home. All are fitted with air source heat pumps – the latest in green home heating technology. These are highly energy efficient units which take heat energy from the air – even on the coldest winter’s night – and convert it to heat for the home. Due to advances in the technology, they are as easy to use as traditional methods and just as reliable – delivering a high level of savings when compared to the same usage of conventional energy sources. They are available with financial support through the Government’s Help to Buy scheme, an initiative which is helping housebuyers in North Yorkshire to move on to, or up, the property ladder in ever-increasing numbers. As part of the scheme, house purchases at Regency Place only require a five per cent deposit. It offers homebuyers a 20 per cent equity loan from the Government, which is interest-free for five years. “It’s often overlooked that Help to Buy is not just for first-time buyers – it opens the doors to established homeowners too who have since sold their own properties,” said Dan Newett, managing director of Berkeley DeVeer. 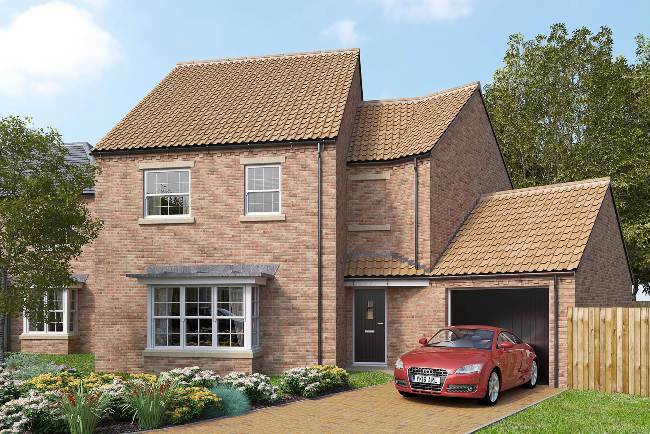 “Regency Place offers a family of homes tailored to meet the needs of a growing local community, particularly the demand for new-build homes, and fit well with the organic growth of the village. The affordable homes form part of the final phase of Regency Place and will be made available through a housing association at a later date. The station – which sat on the single branch line between Masham, Melmerby and Ripon – drew around 8,000 passenger journeys a year, as well running a daily livestock train. Although it closed in 1931 to passengers, World War Two gave it a new lease of life as the station acted as a transhipment point for as many as 76,000 tons of munitions stored locally each year. According to historians, during the build-up to D-Day 42 trains were dispatched from Tanfield, each with up to 50 wagons. Dan added: “This is the latest in a number of award-winning sites we have brought to life in North Yorkshire, including developments at Melmerby, Northallerton and Church Fenton.